The Chicago Blackhawks are champions once again. The Hawks captured their third Stanley Cup championship since 2010 on Monday night, defeating the Tampa Bay Lightning 2-0 in Game 6 of the 2015 Stanley Cup Final at the United Center in Chicago. In what was one of the most tightly contested Final’s in recent memory, the Blackhawks used their playoff pedigree to overcome the Lightning in six games. Led by Duncan Keith, Jonathan Toews, Brandon Saad and Corey Crawford, the Blackhawks have firmly fixed themselves as a modern-day dynasty, capturing three Stanley Cups in the past six years. Chicago was dominant on their road to the title in the 2015 playoffs, defeating Nashville, Minnesota, Anaheim and then Tampa Bay, all 100+ point teams, en route to hoisting Lord Stanley’s Cup. An impressive resume of success against some of the best teams in the NHL this season. The series was a tight affair and a treat for hockey fans everywhere to watch. After the Hawks took game one of the series on the road, the Lightning rattled off two consecutive wins in Games two and three to take a 2-1 series lead. Chicago then showed their playoff experience, notching back-to-back wins in Games four and five to set up a chance to claim the title on home ice. With the prize in their sights, the Hawks headed home to the raucous United Center, eager to give their fans a championship at home for the first time since 1938, a span of 77 years. After almost two periods of play that was indicative of the entire series – tight-checking and low scoring - Duncan Keith gave the Hawks a 1-0 lead on a dynamite solo effort with 2:47 to play in the second period. With the building on their feet and in full voice, Chicago entered the third period with a lead, something they had not relinquished once in the 2015 playoffs. The third period proved to be as close as the rest of the series, with neither team giving the other much room to create opportunities. Patrick Kane, who was an offensive threat all night, finished off a tic-tac-toe play from Brandon Saad and Brad Richards at 14:46 of the final frame to give the Hawks a two goal cushion and ultimately seal the Bolts’ fate. The Lightning mounted a late push, but it was not to be. The celebration in Chicago was on as the fans in the United Center counted down the seconds to the final buzzer. A long sought after home-ice Stanley Cup victory for one of America’s great sports towns was a reality. Duncan Keith, who scored the game-winning goal in the series clincher, was unanimously named the 2015 Conn Smythe Trophy winner as the MVP of the Stanley Cup playoffs. The stalwart defenseman was a force for the Hawks on the blueline, accumulating 21 points in 23 games, registering a +16 rating and becoming just the fourth player in NHL history to log more than 700 minutes in the playoffs. After accepting the Cup, Blackhawks captain Jonathan Toews immediately passed it off to Kimmo Timonen who, after 16 seasons and numerous close calls in a number of big-stage series’ and games, finally fulfilled his hockey dream by hoisting the most famous trophy in sports. With his wife and children in attendance, it was a fitting way for the veteran defenseman to cap off his career. 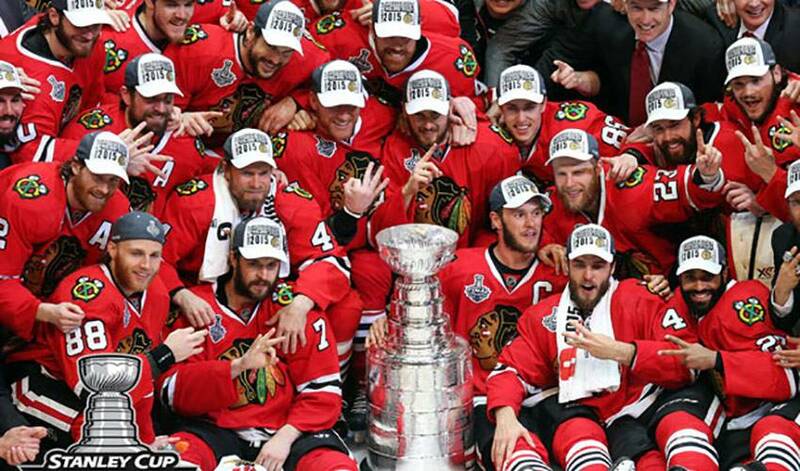 With their third Stanley Cup championship in six years, the Blackhawks are truly the gold standard in the NHL today. Congrats to the 2015 Stanley Cup champion, Chicago Blackhawks, from the staff and members of the NHLPA.